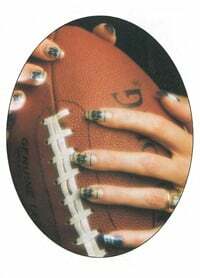 Sports fans in the Green Bay area love their teams,” says Lisa Gustafson, nail manager at InStyle in Green Bay, Wis. So much so that some of her clients like to display their team spirit with nail art. When the University of Wisconsin in Madison played in the Rose Bowl two years ago, clients who attended the game wore the team’s mascot, Bucky Badger, on their nails. Clients who are Green Bay Packers fans occasionally sport a helmet with their favorite player’s number on a nail. And earlier this year, when the University of Wisconsin in Green Bay returned from the NCAA championships, even though they lost, some clients showed their support by wearing the college’s mascot, the Phoenix, on one of their nails. Before LaDonna Ott moved back home to South Bend, Ind., from California almost two years ago, she had forgotten how important college sports are to the locals. But now that she’s working as a nail technician at Michael & Co. in Elkhart, Ind., sports-minded clients don’t let her forget and often request nail art designs incorporating Notre Dame or Indiana University logos. “I had no idea how popular my Notre Dame nail art would become,” says Ott. The design started a chain reaction, she says, which landed a write-up on her Notre Dame nails in the local newspaper, the South Bend Tribune. Ott, who charges only $10 for the design on all 10 nails, says she doesn’t charge a lot for her nail art because it makes her happy just to see clients wearing it. “Besides, since nail art isn’t nearly as popular here as it is in California, it’s a good way to promote it,” she says.